Which brings me to today’s wedding cake – it’s very rustic but also elegant, which isn’t an easy combination to pull off. 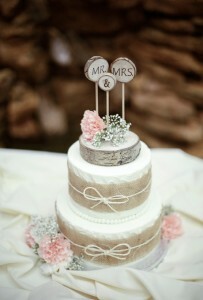 This simple, two-tier cake features simple white icing but the burlap and bow embellishment gives it a shabby chic feel. The third “tier” is really a tree-stump inspired cake topper and it is the perfect addition for this cake. It’s a simple yet elegant cake and it’s perfect for a fall wedding. You can find this rustic wedding cake here. It was created by The Crown Room.